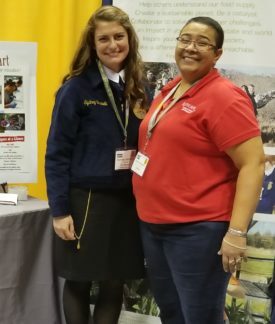 Share the post "Rutgers Students and Staff Attend 2018 National FFA Convention"
Sharice Richardson (l) and Laura Mitchell from Office of Academic Programs, staffed the Rutgers exhibit at 2018 FFA convention. 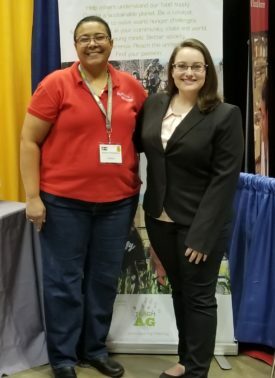 Rutgers School of Environmental and Biological Sciences (SEBS) students and staff attended the 91st National FFA Convention & Expo in Indianapolis, October 24-27. Every year, FFA members nationwide converge to celebrate their accomplishments and find inspiration for their next steps. The event involved an exciting amount of motivational keynote speakers, energetic concerts, fulfilling workshops and an expo floor that offered a variety of agricultural education and industry opportunities. This year the SEBS Office of Academic Programs participated as a vendor at the expo where academic dean, Sharice Richardson and administrative assistant, Laura Mitchell were able to engage with students from all over the country on what Rutgers has to offer. American FFA Degree recipient Syndey Gavinelli (l) and Sharice Richardson. Syndey Gavinelli, an Animal Science major and Kelsey Stockton, an Environmental and Business Economics major, both earned one of the highest degrees achievable in the National FFA Organization, the American FFA Degree. The degree is granted to FFA members who show dedication to their chapter and state FFA association. American FFA Degree recipients show promise for the future and have gone above and beyond to achieve excellence. Stockton, who served as the 2017-2018 New Jersey State FFA Secretary and the 2016-2017 New Jersey State FFA Parliamentarian also presented a student workshop session titled “Investigation Inclusion” during the convention. Brittany Smith, an Animal Science major who is 2018-2019 New Jersey State FFA Secretary and Owen Donnelly, an Agriculture and Food Systems major competed in the Dairy Cattle Evaluation and Management Career Development event. They helped Warren Hills FFA earn the bronze team emblem. American FFA Degree recipient Kelsey Stockton (r) and Sharice Richardson. Francesca Buchalski, an Animal Science major who is in the SEBS general honors program, competed in the Veterinary Science Agricultural Proficiency competition and earned a gold individual emblem. In addition to the 15 areas of competition, known as career development events, the delegates will also elect a national slate of officers for the coming year. The National FFA Organization is the premier youth organization dedicated to preparing members for leadership and careers in the science, business and technology of agriculture. Cultivating their passion and connecting them to innovative thought processes and cutting-edge technology is critical to their individual ability to support and contribute to future sustainability in farming, science, medicine, and business. Founded in 1926 as the New Farmers of Virginia, the movement grew and the Future Farmers of America was formed in 1928 with the first national convention held in Kansas City, Mo. With changes and diversity in agriculture, the group changed its name to National FFA Organization in 1988. The organization has more than 650,000 members, ages 12-21, in 8,568 chapters in all 50 states, Puerto Rico and the U.S. Virgin Islands.